Today marks the 13th anniversary of what is probably the defining event of my generation. My grandparents had Pearl Harbor. My parents, Kennedy’s assassination. For me and most of my friends, it was 9/11. As for that particular day, it was the same for me as most people, I suspect. There was a lot of stunned silence and disbelief. Productivity was nonexistent. The world felt strange and different. I wrote a tribute on the tenth anniversary discussing the aftermath. Today happens to be Throwback Thursday, and since it coincides with the anniversary of 9/11, I thought it would be the perfect time to share this photo. I thought about cropping out the date stamp in the bottom right corner – I can’t believe I actually ruined perfectly good photos by including that obtrusive mark (and on film, no less) – but decided I like it. It reflects a more innocent era. In the fall of 1997, my ex-wife and I, along with our two-year old son Rusty and my parents, flew back east to visit family in Trenton, New Jersey. The highlight of our vacation was a day trip to New York City to catch a taping of The Late Show with David Letterman. We arrived by train in the morning, and had a full day to kill. Our very first decision was which skyscraper to visit, the World Trade Center or the Empire State Building. We agreed unanimously on the latter, probably because it was more architecturally appealing. In retrospect I kind of wish we’d gone to the WTC instead, but I had been there before so I can’t say I have any real regrets. It wasn’t a beautiful day by NYC standards. The city was in the grip of a heatwave, temps pushing well into the 80s and the sky rather hazy. But, that view! It was phenomenal. 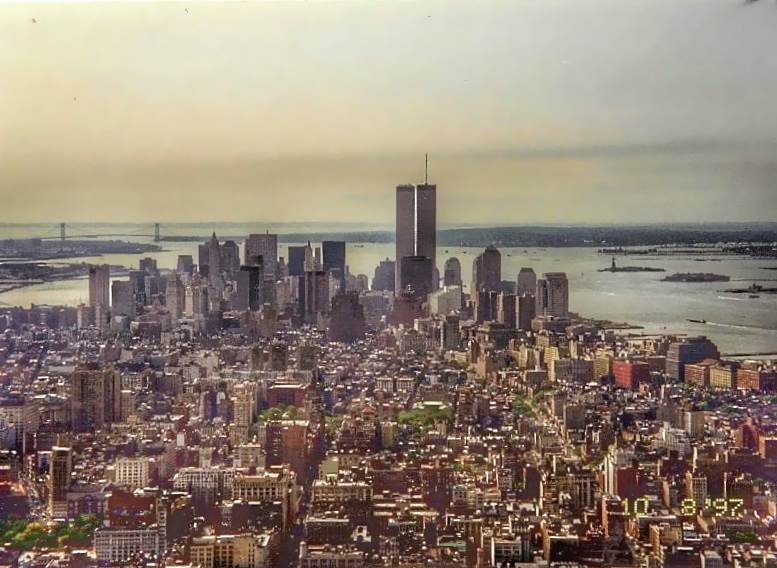 I trained my camera on the Manhattan skyline, clearly focused on the Twin Towers. It still amazes me just how much they dominated the New York City skyline. Hard to believe less than four years later, they would be gone forever. This view no longer exists, hasn’t existed for thirteen years.That is just incredibly sad to me. I’m so thankful I got to experience it in person. I only wish I appreciated it more at the time. But, why would I? Nobody knew what was coming. There’s a lesson here about living in the moment, stopping to smell the roses, etc. No need to discuss the obvious. And me as well. Whenever I watch a movie and see a view of the Twin Towers, it hits me in the gut. Also, whenever I take the bus into NYC and see the skyline void of the Twin Towers, it sadness me to no end. Amen. And thank you for sharing this post, buddy. I’m the same way, Ron. I frequently watch “Barney Miller,” and the opening shot features the Twin Towers. Always makes me pause. Hope your weekend is awesome and you can relax after all that intense training! Good post. A horrible day that changed the way we live and lost a lot of lives! We will never forget. At least we had this good day in October, 1997 to remember. Hard to believe that was 17 years ago! I’m glad you kept the date on the photo for the post. Very poignant. My husband did his co-op internship in college at the WTC. We have lots of photos from that time. Wow…I’ll bet he has some great memories. Did he know anybody who still worked there on 9/11? I have a cousin that worked in the WT. She happened to call in sick that day of the 1993 car bombing and happened to call in sick this day. The loss of friends and internalizing her fate not to be there has caused her emotional distress from which she has never fully recovered. I cannot imagine how lucky she must feel, Carl. Though that survivor’s guilt has got to be a tough thing to live with, as you mention.